This light is beautiful! It looks great in my entryway. There is nothing cheesy or cheap about the crystals or the polished nickel. The lights bounces beautiful colors on the crystals. I would definitely recommend to anyone who wants crystal lighting. I'm already getting compliments. 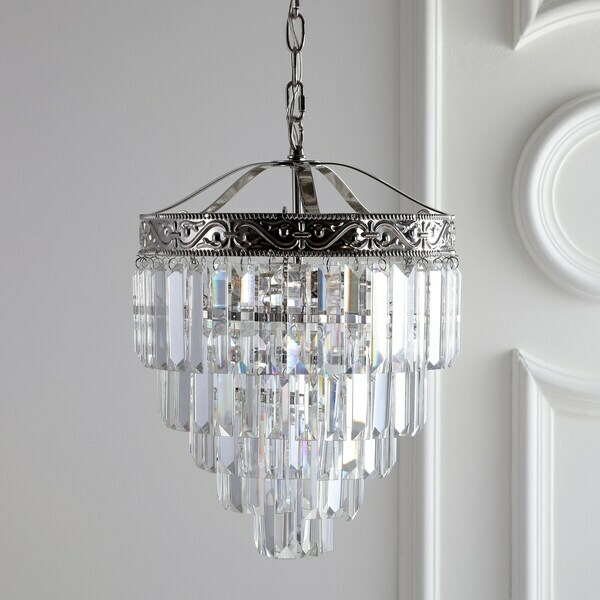 Add timeless elegance to your space with this clear crystal chandelier and its sparkling shade made from faceted rectangles. A band of polished nickel metal adorns the top of the tiered, upside down cake design. This striking accent brightens your home with 2 lights and is compatible with any 40W bulbs, including CFL or LED. Dimensions 12.0 In. X 12.0 In. X 17.0 In. This could work with a sloped ceiling but you would need a different canopy. "Can this chandelier be a flush mount?"